Do you have fun plans for Thanksgiving yet? I bet you’re looking for a hairstyle that makes a statement? Maybe one that is truly simple to make? Then you’ve come to the right place! 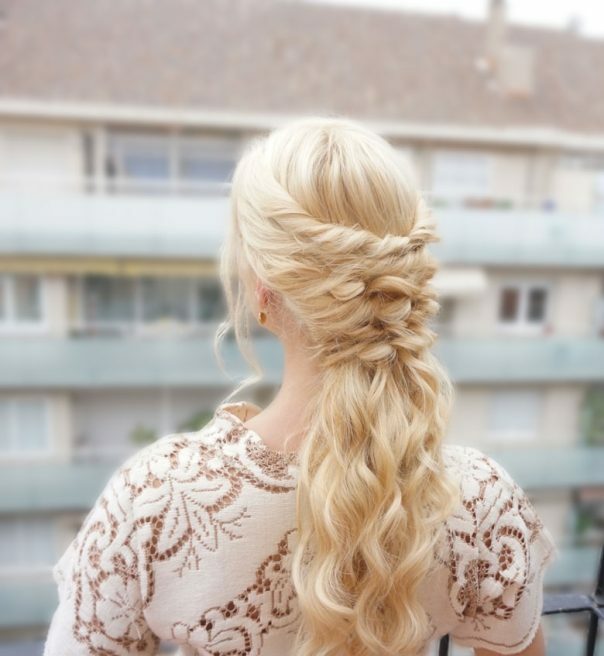 If you know me, even a tiny bit, then you know I have a soft spot for unique hairstyles that are very ease to make! Because let’s face it, in the midst of celebrations with family and friends, many of us just don’t have the time to style our hair for hours. Use a curling wand or iron to curl all of your hair in the direction away from your face. Leave out any face framing pieces you wish to have down and take two small sections on each side and twist them away from your face. Gather them in the back and tie with a clear elastic. Go back and pull on the twists to make them fluffy and full. Take two additional sections below, twist them and tie them in the back as well, but a bit off center. You can take the little tail and flip it over the elastic, topsy tail style. Go back and pull on the edges of the twists. Again, take two sections below and tie them with an elastic off center to the other side. Flip the tail and pull on the edges of the twists. Repeat these simple steps until you reach the nape of your neck. Each time you tie the two sections in the back, tie them in a slightly different place than the ones above. TIP: Try to make the sections as fluffy as possible to hide all the elastics and help them blend well. If you need to fill in any gaps, use bobby pins and slide them in horizontally to pin the sections together. I hope you enjoyed this simple hair tutorial! Happy Thanksgiving! For more awesome hair inspiration and tutorials, visit Hairs Affairs.